Activists first began to drum up attention for their event on Wednesday with a press release announcing they would deliver more than a quarter of a million signatures to the store at Apple's Grand Central Terminal in an effort to highlight claims of worker abuse at Foxconn, the overseas manufacturer of Apple's devices. In reality, little more than a dozen supporters arrived on Thursday, according to CNet, a number that was "far outstripped" by the number of media representatives on hand to cover the event. The event was organized by SumofUs and Change.org, and organizer Sarah Ryan told author Roger Cheng that the purpose of the event was not meant to have a large crowd, but instead to hand-deliver the petitions and bring attention to working conditions at Chinese factories that assemble products like the iPhone. "Apple was definitely ready for us," she said. "They were very polite. Hopefully, they understand the magnitude of the signatures." The activists have not called for a boycott of Apple products, but hope that the company will do more to address employee working conditions overseas. The petitions come soon after a pair of media reports highlighted Foxconn and its relationship with Apple. A pair of stories from The New York Times late last month examined the "human costs" that go into the iPhone and other devices, while this week a separate report from news network CNN featured an interview with an anonymous Foxconn worker who said she has never seen an iPad in person, even though she assembles them at a mega-factory in Chengdu, China. 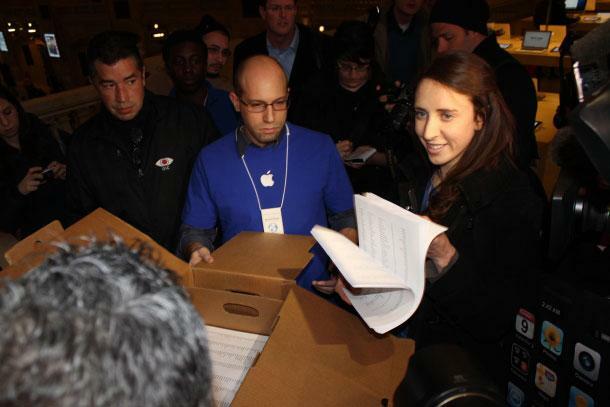 Workers rights petitions handed to Apple employees at Grand Central Terminal on Thursday. Photo via CNet. Media characterizations of Foxconn have portrayed the company as one that does not provide adequate benefits to workers, and often requires them to work long overtime hours. Employees have also staged demonstrations, with including a number who threatened suicide earlier this year at a plant that manufactures Xbox 360 consoles for Microsoft. For its part, Apple has fired back at accusations that it does not do enough to counter substandard working conditions overseas. Apple CEO Tim Cook last month issued an e-mail to employees, stating that Apple will continue to scrutinize its supply chain and will inevitably find more issues, but that the company will never turn a blind eye to worker-related problems.